Yoshi Falls is a race course in Mario Kart DS as the second track of the Mushroom Cup. The track is located in a crater-like valley, circling a lake with three waterfalls connected to the body of water, crossing the track. 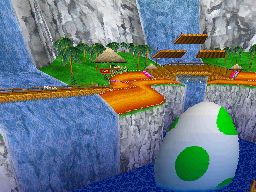 A large Yoshi Egg is found in the center of the lake. Numerous Dash Panels are located at some places along the course. Bridges do provide a safer way to pass, as opposed to going through the waterfall rapids, which is a risk, due to being able to be pushed off the edge. The course returns as the second classic retro course in Mario Kart Wii for the Shell Cup. It was remade with improved graphics, along with most Mario Kart DS courses on the Wii. Yoshi Falls is one of the shortest courses in Mario Kart DS, along with other quite short areas such as GCN Baby Park, N64 Moo Moo Farm, GBA Peach Circuit and SNES Mario Circuit 1. It is the shortest nitro course in the game. The track's overview is quite similar to Luigi Circuit from Mario Kart Wii. Racers start far from the edge of the cliff and are protected by a wooden bar. As they go onwards, they can take either the upper half of the track or the lower half, taking advantage of the faster path but also being vulnerable to falling off or being pushed off by the rapids crossing the path. The upper level, however, has a bridge to cross safely over the waters, and handy Item Boxes. Racers then must take the second bridge, also containing Item Boxes. The stream of the second rapid down the bridge is more powerful, so it results in the racer more likely to fall off this way. Certain items, such as a Star would serve to pass the rapid obstacles and gain more time. Briefly, past the second bridge, characters can run over Dash Panels in the upper half, while the lower half has none of these speed boosters. Some Item Boxes appear down the third bridge, unlike the upper stretch which does not have any. Once racers have passed the third bridge, there are more Dash Panels on the upper half of the course appearing before the track ends at the finish line. This final stretch is a good opportunity to perform a wheelie. There are two missions involving this circuit: 1-3 and 3-4. In mission 1-3, the player has to destroy the 10 item boxes, and in mission 3-4, they have to cross the finish line in a single lap before Yoshi. "Huge waterfalls cut through the course in Yoshi Falls. Try to hit as many dash panels as you can, and don't follow the water over the edge!" "This sloping circuit is awash with waterfalls, so caution is advised. Taking the lower path can give you the edge, until you fall off it; therefore less skilled drivers are urged to take the high road and make full use of the plentiful Dash Panels and Item Boxes." "The exact same as on the DS, only the second bridge is now a great spot to catch some air and trick a Mini-Turbo." "Will you take the high road or the low road? Those waterfalls might look pretty, but driving through them can be dangerous! Bouncy Mushrooms from Mushroom Gorge were added as a shortcut in the second July 2009 tournament. A tournament in Mario Kart Wii took place on this course as the July 2009 second tournament. It was a Wii Wheel only GP race, where players had to use the Mushroom Gorge mushrooms as alternate routes to get around. This page was last edited on December 21, 2018, at 17:35.